On November 20th, PCAPS (Philly Coalition Advocating for Public Schools) launched our Community Schools Campaign. Over a hundred people came together at Arch St. Methodist Church that night to kick off the campaign and discuss the benefits of the community schools model. The event was part of a national week of action in 15 cities across the country, sponsored by the Alliance to Reclaim Our Schools (AROS). In a panel hosted by students from Youth United for Change, community members spoke about their vision for community schools. Panels were Kendra Brooks, President of the Steel School Advisory Committee and a parent leader from ACTION United, Tom Wyatt, another parent from Passyunk Square Civic Association, Tim Boyle, a teacher at Chester Arthur Elementary and a Teaching Consultant for the Philadelphia Writing Project, and Sakiema Wood, PSU member. 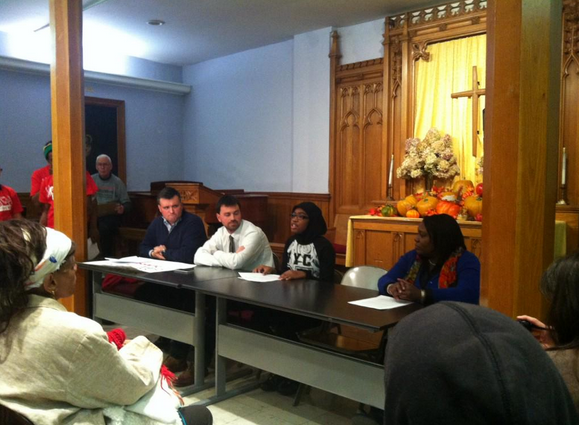 Panelists (left to right): Tom Wyatt, Tim Boyle, Sakiema Wood and Kendra Brooks. Hello, my name is Sakiema Wood, and I am a Senior and Peer Mediator at South Philadelphia High School. I’m also a member of the Philadelphia Student Union. Peer mediation is one way in which we use Restorative practices at my school. Restorative Practices or Restorative Justice is a system of ways to create a positive space and a safe environment for everyone. It’s an alternative to out-of-school suspensions and Zero Tolerance policies. Restorative practice came to my school because students from PSU, YUC, and other members of the Campaign for Nonviolent Schools fought to have restorative practices piloted in 10 city high schools. As students, we feel that suspensions don’t work because most of the time they’re given to students for minor offenses like cutting class, being out of uniform, and arguing with teachers. Students don’t learn any lessons by being suspended, instead they’re sent home for days causing them to miss school work, miss tests, and they’re unable to make up the work that leads to their grades dropping and eventually leading to them being pushed out of school all together. But restorative practices teaches students how they could have handled certain situations they we’re involved in differently. Peer mediation is one the ways restorative practices teaches individuals to understand each other’s feelings and allows them to express themselves without acting out of frustration. It allows for both sides to be heard and helps restore the broken relationship. If the students feel as though they’re not cool with each other peer mediation teaches student to come to a mutual agreement and respect each others feelings. The goal is to keep students in school, not push them out. 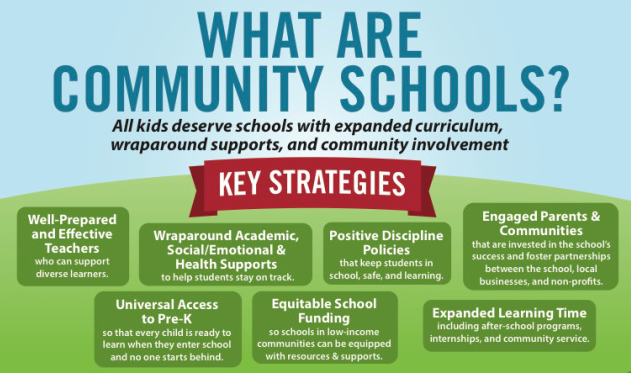 Community schools are important because they can provide resources to the communities they’re in that don’t have access to such things as clinics, libraries, day care centers, and skill building workshops. Mediation training could be one of those skills taught at the school. At a Mediation Center, students, parents, and community members could be trained as community mediators. These individuals could hold mediation at local community centers to help people resolve their differences before things get violent. With mediation in our neighborhoods and at our schools it would lower crime rate, create safe spaces in the community, show community members how to express themselves better without using violence and teach everyone how to respect and love each other. Mediation would be better than calling the police because police are not there to mediate problems, they’re only there to lock people up. Right now our schools are trying to survive with very little funding and support. We need our government to fund our schools, not prisons. Starting with Community Schools is the best way. I believe that if we funded restorative practice programs inside of community schools, we would have fewer violent neighborhoods and schools. Due to a lack of adequate funding, books, support staff like nurses and counselors and programs, students have to go to school under very stressful conditions. It’s hard to learn, and hard to feel like we have a future when you have no resources and only metal detectors and security officers. We’re not criminals, we’re bright students. Instead of closing our schools because of the failures of our governor, mayor, school district officials and the School Reform Commission, we should open them as Community Schools that provide resources to help create positive and safe neighborhoods and schools.